FANBOY PLANET.com . : doctorwho-menu :. Can the Doctor learn to do something with a soldier beyond giving orders? 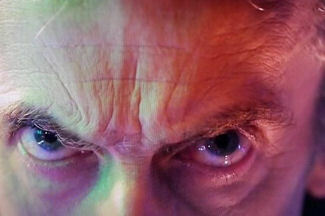 A new face who wears an old face... is Peter Capaldi The Doctor? There seems to be a shoe scandal! Ric has updated with even more costume options! "Monsters of the universe, Capaldi is suited and booted and coming to get you!" We forgot to mention: here's Drew's #1 all-time favorite Doctor Who story! How did the farewell to Matt Smith truly stack up? Will this soothe the pain in our hearts? What happens when you explain the Doctor to someone who just doesn't care? Everybody seen it by now? LET'S TALK ABOUT IT!! #3 in Drew's list of favorite episodes... will "The Day of the Doctor" knock one off? Getting close to the 50th Anniversary... celebrate Eccleston, Tennant and Smith! Drew goes deeper than many in his Whovian status, so it's best to listen to him!. Let us not leave our resident Doctor Who critic out of the conversation!. Phew! Just in time for today's announcement..
"Do you know what these are? THE WRONG HANDS!" Working our way through Drew's "lost" reviews -- starting with the return of Clara! Is it wrong that THIS is why I can hardly wait for Christmas? Time spent with friends is the best time of all? Sing it with me now... "Everybody ought to have an Ood..."
"We have a rule about the bedroom!" Saying good-bye to the Ponds and hello to... WHAT on a spaceship? Jenna-Louise Coleman standing in front of the TARDIS... it must be real! Gaiman reminisces, and even doesn't pick his own episode as his favorite! Now in three different versions depending on your attention spa...hey, come back here! Where did Amy get all those wonderful toys? Monsters are real, but the dollhouse isn't? Nazis, time-traveling miniature executioners and the Doctor in formal wear. This one has it all! How frightening was it the first time British children heard "EXTERMINATE!!!" A panel so big one page could not hold it all! Karen Gillan and Matt Smith conquer San Diego -- plus preview videos! Everything we have so far in a nice hi def package...TARDIS not included. Sorry. Did the Doctor read Twilight? Does loving the Doctor win out over hating pirate stories? The Silence will fall...but ratings will rise in the U.S.! The BBC posts a video prelude to Season 6 -- Nixon! Tapes! Creepiness, but not CREEP! I'll say it here and now, who can blame Rory? Confusion over zoological classifcation... hey, what's with those lizard tongues? "What's so scary it doesn't mind us thinking it's a vampire?". "If I do this, I can't be the Doctor anymore..."
The Eleventh Doctor is here ... is everybody happy? Dark doings at a country mansion...only the Doctor and the plucky Donna can help! A little minisode (thanks to YouTube) to whet your appetite -- twice the TARDIS! The Doctor learns what was meant by "you are not alone..."
Who knew that the Daleks had such a flair for Broadway comedy? "I might use that someday..."